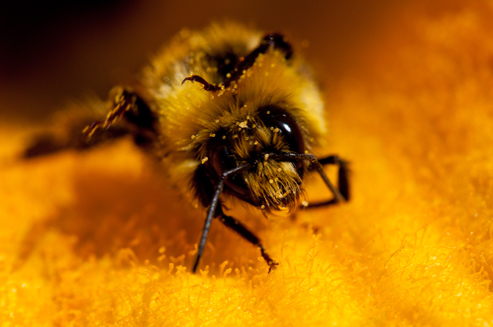 Special tasks require special tools: bees will be detecting explosives and drugs soon! Research proceeded smoothly and the system could be tried and tested at Heathrow Airport. Piotr Gulbicki is talking with Dr Joanna Bagniewska, a zoologist from Nottingham Trent University. …that started in 2003, initiated by scientists who specialise in chemical ecology – the study of chemicals involved in the interactions between living organisms. This research was conducted by a spin-off company from Rothamsted Research – one of the biggest British agricultural research institutions, which also deals with beekeeping. Being a behavioural ecologist, I was responsible for planning research in the context of bees’ behaviour. They were but it was only basic research. This will be the first time for this idea to actually be put into practice. We are hoping to run some tests at Heathrow Airport. Will bees replace customs officers? They will have a chance to help them. These insects have an incredibly strong and sensitive sense of smell, which they use to locate flowers – their food that consists of nectar and pollen. They can easily be taught how to identify specific odours by using classical conditioning, similar to Pavlov’s dogs. We give bees a sample of explosives odour for three seconds and then we feed them sugar for the same period of time. In this way they develop a conditioned response. Every time bees smell explosives they stick their tongues out waiting for sugar. Are they staying in a mini beehive? Our bees are kept in small boxes equipped with infrared beams. When they stick their tongues out, which is their reaction to explosives, the beam is broken and their response is automatically registered and displayed on a screen. Each device contains 36 bees that are trained to detect various substances. For example, we have six control bees that are not trained, and groups of six bees taught to detect Semtex, C3, TNT, heroin and cocaine. We give them a sample of air from the item we want to check and if, for example, fixe out of six “cocaine” bees stick their tongues out it means that this item should be checked for any traces of smuggled cocaine. Can every bee do this? Yes, provided it’s a forager bee. Depending on their age, bees play different functions in a beehive. At the beginning they clean it, then they feed bee broods, build honeycombs, etc., and only when they get older they get outside to forage. We use the oldest honey bees because they have better experience and orientation in the world of smells. Sometimes I’m asked if the bees are hurt. We make sure all our bees are healthy and in good condition – not only for the sake of their own welfare, but also to be effective in detecting smuggled substances. The boxes we keep them in are large enough for the bees to move their wings and legs freely. They’ve been designed based on the size of honeycomb cells where bees spend bigger part of their life. After all, in their natural surroundings bees spend most of their time in a beehive and not outside. We usually see forager bees, which in fact leave the hive for the last three weeks of their life. And the bees only work for us for two or three days. For us it’s enough and we don’t want to overstrain them. Besides, keeping the bees ready for a long time is not easy – you have to make sure the temperature and humidity in the box is right. At the same time you have to feed the bees regularly but not too often so they don’t lose their motivation to work. There is no need to keep the bees in the boxes longer than it’s necessary. After their work is done, the bees retire and they can continue their previous lifestyle. Do you keep your own bees? Rothamsted Research has its own beehives but if we need a larger number of bees we can order them from bee farmers. We are planning to build an indoor flight room so the bees can also work in winter. A normal beehive is not active during this time of year. Wouldn’t it be better to use dogs to detect explosives or drugs? Dogs have been used for this for a long time but bees are cheaper, they learn faster and they are more efficient in detecting smells. Their odour detection threshold is a few parts per trillion, which can be compared to dissolving a drop of substance in twenty Olympic-size swimming pools. A dog would detect the odour only if we added a tablespoon of the substance. It should also be stressed that in many cultures, including Islamic countries, a dog is an unclean animal, which is one of the reasons why we’re trying to find alternatives. Animals’ sense of smell is used in different ways. Very different indeed. In Tanzania, Angola or Mozambique trained rats are used to detect landmines because rats are much smaller than dogs and they don’t trigger explosions. In Israel they look for explosives using mice. They can detect everything that has an odour. They can be used in areas connected with security but also for early diagnosis of such diseases as tuberculosis or bladder cancer. They are able to do so because in the early stage of these diseases, saliva and urine of a sick person smell differently than those of a healthy person. Bees can also be helpful in finding dry rot in building constructions or parasites such as bedbugs. Using the same method as in detecting explosives? It’s the same method but bees are trained to identify different odours. Can other insects be trained like that? I think so, but the question is what for? I guess people wouldn’t be very happy if we started to breed bumblebees or wasps. Bees are bred on a large scale and their populations are not faring very well, so by supporting their breeding we contribute to their future growth. The more bees there are, the better. For a few years now large numbers of bees have been killed by various diseases. The most dangerous one is the colony collapse disorder. Its exact mechanism and causes are unknown. It is believed that it is caused by several factors, including pesticides, pathogens (Nosema ceranae) and parasites (Varroa destructor), but also changes in agriculture (small diversification of farming and no hedgerows forces bees to cover huge distances in search for food). Perspectives for the future are not good either, especially considering the fact that the British government is cutting funding for scientific researches connected with insect ecology. It depends on when the insect was born. Most of the spring and summer worker bees live for about two months, while winter bees (those born at the end of the summer) have to survive winter and live until the next season, which means 6-8 months. The queen can live a few years, and drones – between one and two months. How large is the world population of bees? Dr Joanna Bagniewska – a zoologist and a lecturer at Nottingham Trent University. She graduated from Oxford University and Jacobs University in Bremen. Her doctoral thesis, completed at Wildlife Conservation Research Unit in Oxford, was dedicated to biotelemetry – using advanced technologies to study the ecology and behaviour of wild animals. Her previous research included monitoring the population of South African jackals and foxes, analysing the influence of habitat fragmentation on the population of wombats in the Australian Kosciuszko National Park, as well as working on the eusociality of Damaraland mole rats. Her latest research project was focused on using bees to detect explosives.